This year is my fourth as a New Englander, and while my fascination with snow has waned (or more accurately, plummeted), my obsession with fall has grown exponentially, as the years have passed. During this short interlude between the oppressive humidity of summer and the bone-chilling cold of winter, New England undergoes a ridiculous visual transformation speckled with orange leaves gliding, twirling, and careening their way to the ground. In Boston, on grocery store shelves and farmers market stands, heirloom tomatoes are replaced by squash of every variety. Pumpkin spice lattes are in abundance and everything begins to smell like cinnamon and oak. On the most perfect fall days the air is a crispy cold, leaving your ears and nose just cold enough to remind you that this is the best time of the year. Just recently I had one of those days, when my roommates and I piled into Liz’s car and headed to Honey Pot Hill Orchard for an afternoon of apple picking and cider donut devouring. Apple picking is a New England right of passage; one which I await with eagerness each and every year. This pilgrimage to the suburbs of Massachusetts came towards the end of the apple harvest, so we picked Cortlands, Red Delicious, and Spencers, filling two ten pound bags with the cream of the crop. Exhausted from the “laborious” work of climbing conveniently placed ladders and taking innumerable family photos, we headed to the store, where moist sugar-coated cider donuts awaited our arrival. After saying hello to the billy goats and pigs, we headed back to the city, apples in tow. Our apple supply seems to be akin to the fountain in Tuck Everlasting and, try as we might, we can’t seem to make a dent in it. We’ve made apple crisp, apple cider and apple you-name-it, but it seems as if we’ll never run out. 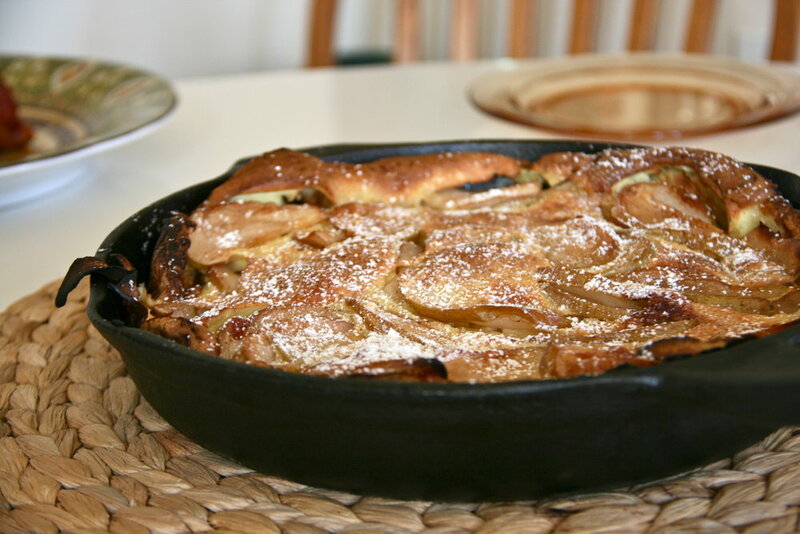 One afternoon, while pondering what the heck I was going to do with all of these apples, I remembered my grandma’s apple pancake, which isn’t really a pancake at all, but a fluffy casserole-like dish made of caramelized apples and woven with springy pancake batter. This is the kind of breakfast you’ll want to eat every day, all day, but take a look at the amount of butter you’ll need and think again. Or, if you’re like me and have a million roommates and/or a million apples, you can crank out these delicious upside-down cake impersonating suckers without the guilt. I hate to sound like an old lady here, but even just smelling the pancake in the oven is like heaven on earth. 2. In a medium sized mixing bowl, whisk eggs, milk, flour, and 1 teaspoon sugar until smooth. 3. Melt butter in a large cast iron (or oven-safe) skillet. 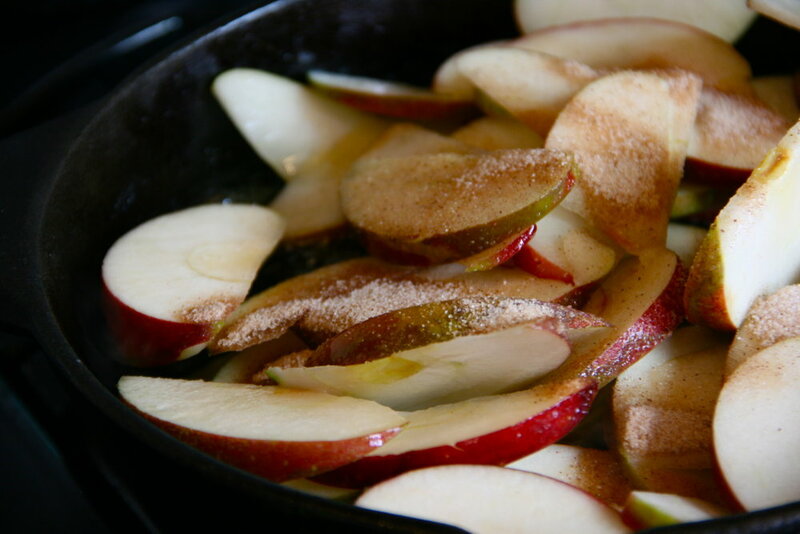 Once glossy, add apples to pan and sauté until lightly cooked. 5. Sautee until barely caramelized, 6-8 minutes. 6. Pour batter over apples, ensuring that it is evenly distributed. 7. Bake for 8-10 minutes and sprinkle with remaining cinnamon sugar mixture. 9. Remove, let cool for a moment, sprinkle with powdered sugar, and serve. *Note: My grandmother’s recipe calls for turning the oven up to 375 degrees and baking until puffy and brown, which I’d imagine is much less than 30 minutes. However, I have yet to fully understand my oven and accidentally turned it off. Despite the “mistake,” this created a lovely caramelized texture and look on top while the inside remained moist and fluffy.